Daredevil has been consistently beautiful for each of its #32 issues. Beauty in this case, is not just coming from an art perspective. Mark Waid has carefully written one of the greatest modern superhero epics ever. This is a run that is going to remembered until the end of time from a comics standpoint. The writer and artist have the uncanny ability to meld the past into the character with relative ease. The monster craze of the 1950’s looks to be the element being utilized in this issue, with the reveal that teased more interesting material in the last issue. These touchstones of older culture thrown into the mix, is something that is a motif in all of the work of Mark Waid. 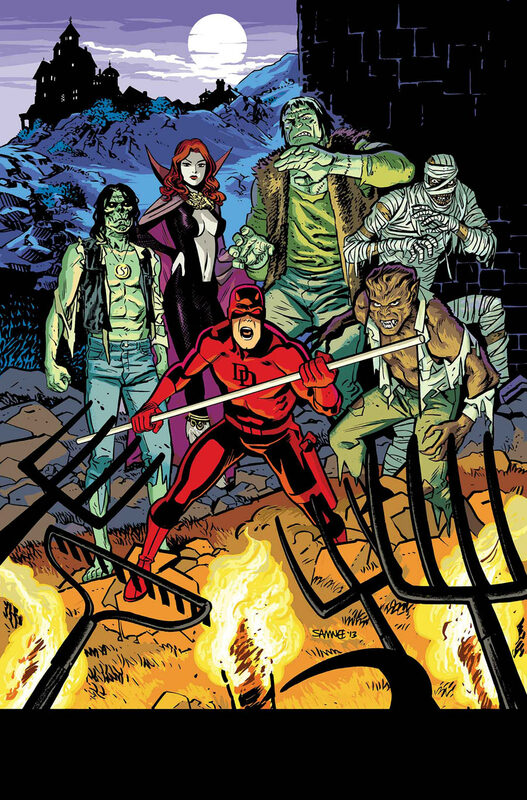 The author has openly addressed the fact that Daredevil is not a silver age throwback title by introducing real elements of horror and paranoia. There is no doubt in my mind that this current incarnation of the hornhead is fun, yet elements of large scale drama are also thrown into the mix. There has been a real sense of dedication to stay true to Foggy Nelson’s cancer struggles. Waid opens the issue with some fascinating voice over for the Jester that makes the impossible a reality. After only reading the opening page, many will be perplexed by the antagonist. He is not the smartest, or even the most likeable villain, but still witty in his own sort of style. The cliffhanger to the last issue is fortunately addressed immediately. Having the death be a cop out so soon after the supporting character is in dire straights, lessens much of the impact here. In fact, the death was a big mistake and play just to get a cliffhanger last issue. A certain line about a certain doctor, rebounds the book on the subject of the cliffhanger. The moment is very funny, and moves into a scene that is just as comical, in it’s own right. Interplay with the characters involved amount to the narrative being more than the sum of the parts. There is also some quite subversive material delivered by the Jester on the very nature of storytelling. Samnee is an artist that most long term fans of the medium will instantly gravitate towards. The artist incorporates so many wonderful elements mixed together in an insane melting pot, that boil into a wildly inventive style. Unlike the vast majority of comic book artists in this caliber, Samnee is a monthly warrior and has stayed extremely consistent from his tenure on the title. The opening page has a mundane layout, with an incredibly expressive villain, munching on popcorn in an over the top way that beautifully crafts the illusion of motion. The artist is thoroughly aware that this is a static medium, tricks must be crafted in order to deceive the brain and motion in between each panel. Samnee also still manages to find some interesting new poses for Daredevil, after countless years of artists drawing the body in one specific manner. The penciller carefully includes in detail to create some vivid differentiation for clarity. A panel filled with silhouette is so perfectly placed among the surroundings of the comic. Waid and Samnee are still crafting excellence in Daredevil.